Home Apps Free 9GAG App For Windows 8: 9GAG – Why So Serious? Free 9GAG App For Windows 8: 9GAG – Why So Serious? 9GAG – Why So Serious? 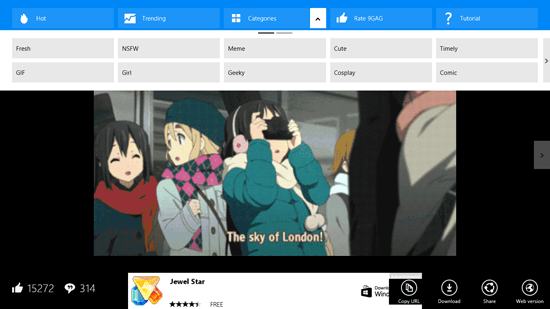 is an app for browsing 9GAG funny images and videos. It is a free 9GAG app for Windows 8 and 8.1. The app is based on the famous social media website of 9GAG, Inc. The website has user-generated funny images and videos. The app is great to have a good laugh not only with your friends but also alone. You can spend hours on it reading the images or going through videos but it would not end. On the start-up of the 9GAG app, you are asked for giving the app permission to access your location. After allowing it, a small walk through for the app starts telling you about different options available to you within the 9GAG app. The 9GAG app has been developed nicely, the menu and the options on the app are hidden unless you right click on the 9GAG app somewhere. 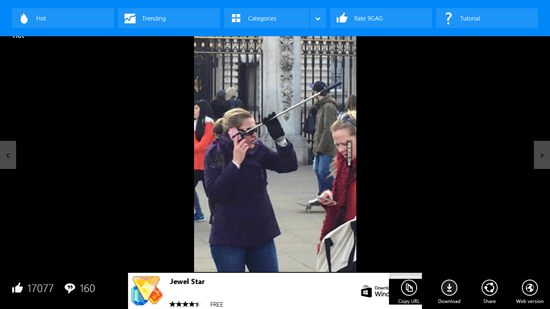 The images shown on the startup of 9GAG app are from the Hot section that shows the present or new images or videos. Near Hot section there is section for Trending, it shows the trending or popular images and videos. There are other categories that you can choose the images or videos to display including Fresh, GIF, Girl, NSFW, Meme, Geeky, Cute, Cosplay, Timely, Comic, Food and WTF. The images can be viewed by toggling the left or right buttons on the screen for previous and next image in the list or with the help of arrow keys from your keyboard. To download or save the image to your desktop you can right click anywhere on the 9GAG app and click on download button on bottom right. There are other options like copy URL, share and web version for the image in options. You can choose the one that suits your requirement. When you click on the like or comment buttons of the image, you will be redirected to the website of 9GAG. You can comment or like the image on the website directly. Get 9GAG – Why So Serious?